Mahliza Liny, Indosat said the certainty of marketing communication group J-Rock band for a gig at Batam has been accepted by Indosat Batam. Band consisting of four personnel each Iman (vocals, guitar), Sony (guitar), Asfihani (bass) and Anton (drums) will entertain the youngsters, especially Batam and adolescents, J-Rockstar communities who are fans J-Rocks, subscribers of Indosat. The concert was scheduled to take place at 19:00 with 10,000 entrance fee. 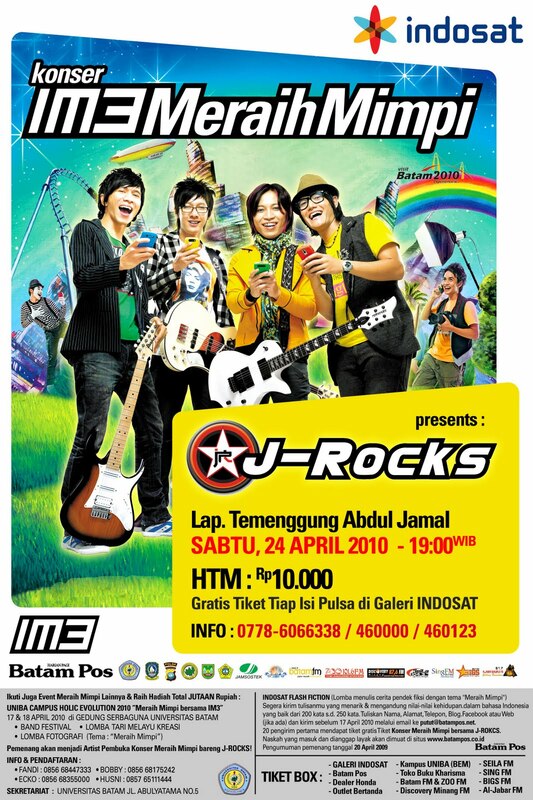 By J-Rocks concert, IM3 also held several events aimed at the youth competition and a student of Batam. Among these bands competition, dancer and writing a short scientific competitions. 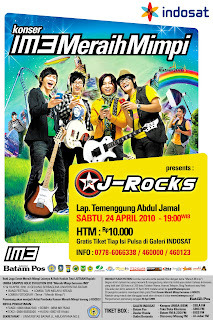 "The J-Rocks concert, there was an opening band and dancers welcome," said Liny, close calls in the Galery indosat Mahliza Liny. Music concert is free for our customers who fill in galleries Indosat pulse in Batam. Indosat customers can get the contents of 10,000 pulses 1 free ticket. While the upward pulse Rp20.000 can get two free tickets. In Batam Indosat there are three galleries, each in Baloi, Batam Centre and Panbil. Ticket information can call 0778-6066338/6000815 Indosat and Batam Pos 0778 460000/460123. Segment teens and students who become shooting mobile operators, the special attention of IM3 Indosat through prepaid cards. Working on this potential market by Liny really need to show some innovation by bringing your favorite artist. "Hopefully, this mat can make our customers become more loyal and continue to use the product as a telecommunication mobile operator," lid Liny.